It’s important for India to maintain good relations with Russia and the United States, but there are some red lines that need to be drawn when it comes to the latter. Indian Prime Minister Narendra Modi’s much-hyped visit to the United States begins later this week, and there seems to be optimism on both sides that diplomatic relations will pick up momentum after the Devyani Khobragade affair. Like Fareed Zakaria did when he interviewed Modi on CNN, members of the American media are going to prod the Indian prime minister on the country’s policy towards Russia, a country that has managed to get into the “bad guys” list of the Western media. Modi handled Zakaria with a great amount of tact, but U.S. President Barack Obama is not a member of the press and is going to be a lot more forceful on the Russian question. When Obama visited India in 2010, he called out India for not being more assertive about democracy in Myanmar. Oddly enough, American companies are now swooping down on the country formerly called Burma, despite serious questions about the state of democracy there. It’s heartening to know that no matter who is in power in New Delhi, Indo-Russian relations are accorded high priority and India will not be swayed by Western pressure. The fact is that India’s relations with Russia and America are not a zero-sum game. This is something that Russian President Vladimir Putin clearly understands. In fact, he praised India’s “restraint and objectivity” when it came to Crimea’s reunification with Russia. It’s the White House and the U.S. State Department on the other hand that clubs countries into categories, and are intent on dividing the world. 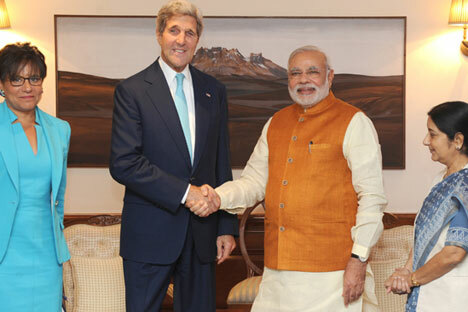 There’s a lot that India can gain by maintaining cordial and friendly relations with America. For starters, the U.S. has the best higher education system in the world, and a large number of Indian students are doing their doctorates in the country, especially in science and technology. Given the fact that America is not very keen to hand out green cards to these highly skilled PhDs, there is a great chance that these people may come back to India and invent something spectacular. Essentially, the American taxpayer subsidises an Indian doctorate student, who then comes back and applies his or her knowledge back home. There is also a large Indian Diaspora in the United States, which acts as a bridge between the two countries. Some members of this community tend to be more American than apple pie and aggressively push U.S. geopolitical interests, but the majority of Indian-Americans just want closer cultural and economic ties between the two countries. India can work with this community to help secure mutual interests. There are certain industries where it would be foolhardy for the Indian establishment to rely without precautions on the United States. Take the nuclear power industry for example. There is so little information about the Mithi Virdhi project in Gujarat, where Westinghouse Electric is providing AP-1000 reactors. After then Prime Minister Manmohan Singh visited the U.S. last year, a deal, whose terms were mostly hidden, was signed. We do know that the cost per unit from that plant will be around 12 rupees per kilowatt-hour (kWh), compared to around 6 rupees per kWh for the Kudankulam Nuclear Power Plant’s third and fourth units, where India’s civil nuclear liability law is being applied. Do we even know if the more expensive units of the Mithi Virdhi project come under the same law? There was so much secrecy when the deal was signed last year and the Indian media was in a hush-up mode. Then there’s the defence industry. It’s important for India to diversify its purchases and focus on indigenisation. In fact, joint ventures like BrahMos set a precedent of what India can do when teaming up with reliable partners like Russia that share technology and knowhow. A supplier like Russia will not link deliveries to geopolitics, as we have seen recently with France and the Mistrals. The United States has periodically gone back on its contractual obligations when it comes to arms supplies. Not only does America refuse to transfer technology, in layman’s terms, it reserves the right to take money and then not deliver weapons on flimsy grounds, especially if there is a war. When it comes to the U.S., India needs to focus on its interests and find areas where there is a true convergence. Being too dependent on Washington is a sure fire recipe for disaster. The American foreign policy doctrine is based on the concepts of interests and not that of friendship. It would take very little for India to turn into what the U.S. calls a pariah. On the other hand, there is a strong and unshakeable foundation when it comes to India’s bilateral relations with Russia. It’s not that New Delhi’s relationship with Moscow is trouble-free, but then ties are based on a clear bond and understanding. India’s relations with both countries are important and mutually exclusive, but at the same time, it pays to know who the real friend is.